There are few people who don't appreciate a chocolate dessert. If you're planning a fancy dinner party or even just an evening with friends, consider serving one of these delicious chocolate recipe creations. Your guests will thank you. Removing flour from cookies allows the rich taste of the chocolate to shine through. Serve these cookies alongside a dish of freshly made gelato to offer a variety of flavors to your guests. Mix well and scrape down the sides until the dry ingredients have been completely incorporated. Drop the batter by the teaspoon onto cookie sheets lined with parchment paper and bake for 8 – 10 minutes at 350 degrees until the cookies have a lightly sheened and cracked surface. Allow to cool on the cookie sheet completely before handling. 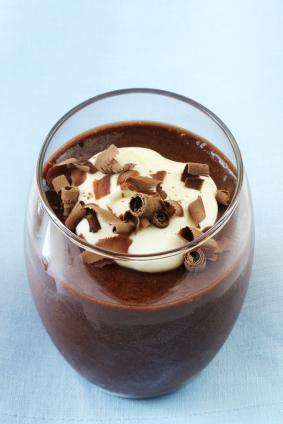 Chocolate mousse is a light and airy confection that is the perfect finisher to a heavy meal. This recipe is deceptively simple, using only two ingredients to let the taste of the chocolate come through. Beat the cream in a chilled bowl until stiff peaks begin to form. Set aside. Heat the chocolate in a double boiler until completely melted. Remove from heat. Stir one-third of the whipped cream into the chocolate, mixing it in a little at a time to avoid seizing the chocolate. When fully incorporated, pour the chocolate mixture into the rest of the cream and mix gently. Divide into four dessert bowls and top with chocolate shavings. Meringue is light and crisp – the perfect treat for anytime. The addition of chocolate and cayenne pepper turn ordinary meringues into something truly gourmet. In a large bowl, beat the egg whites with the cream of tartar until foamy. Pour in the sugar, a little at a time, beating constantly until stiff peaks begin to form. Stir in the cocoa powder and cayenne pepper and continue to mix until well incorporated. Drop the egg white mixture onto a cookie sheet lined with parchment paper and bake at 200 degrees for three hours. Turn off the oven and let sit for one hour before removing and storing in a cool, dry place. There are numerous types of desserts that feature chocolate as the star ingredient. Endlessly moldable, available in powder or brick form, sweetened or unsweetened, chocolate can be added or adapted to nearly any occasion. Substitute the cherries in the cookie recipe with dried figs, pineapple or dates until you find a combination that works well for you. Mix different kinds of chocolate and try increasing the amount of cayenne pepper in the meringues; with a little experimentation you can create a fancy chocolate dessert that is completely your own.